Provide comfort for the family of George Wynne with a meaningful gesture of sympathy. George Day Wynne, Jr. (82) passed away from complications of Alzheimer's Disease on December 3, 2018. He was born August 28, 1936 in Lexington, MS. and remained a permanent resident of Holmes County for the rest of his life. He attended Holmes Agricultural High School and graduated from Mississippi State University with a degree in Agriculture. He was a lifelong farmer and rancher raising cattle and growing crops. He served as a board member for numerous farm groups and organizations. A devout Christian, he was a lifelong member of Pickens Baptist Church where he served as a deacon and on numerous committees. George was truly devoted to his family and friends. He was a husband, father, brother, uncle and grandfather, whose life revolved around his family. He married the mother of his children, Charlotte Wynne, on August 16, 1957 and was married to her for 48 years until her death in 2005. In 2007, her married Janie Loflin to whom he was married until his death. Survivors include his wife, Janie; sons, David Wynne (JuliAnna) of Pickens and Terry Wynne (Renee) of Pickens, daughters, Angie Blain (Cham) of Pickens and Allison McQuirter (Dan) of Madison. Stepsons: Charles Loflin (Malinda) of New Jersey, Dan Loflin (Trudy) of Lena and Bryan Loflin (Sara) of Colorado. Sisters: Patsy Rogers and Faye Wilson, both of Lexington. Grandchildren: Ashley Scobey(Graham), John-David Wynne (Melissa), Hunter Blain, Terrell Wynne, Haley Blain, Paige Wynne, Elizabeth Wynne, Grace McQuirter and Davis McQuirter. Step Grandchildren: Laura Leigh Ladner, Connor Morgan, Lauren, Caroline and Cooper Loflin, and three great grandchildren. George was preceded in death by his parents, George and Gladys Wynne and his first wife, Charlotte Pinkard Wynne. The family wishes to express their sincere appreciation to Dr. Paul VanLandingham and Angela Patterson, RN, Carolyn Roberson and Addie Johnson. Visitation will be at Southern Funeral Home in Lexington, MS. Thursday, December 6, 2018 from 5:00 p.m. - 8:00 p.m. Pre-Funeral visitation will be at Pickens Baptist Church on Friday, December 7, 2018 from 12:00p.m. - 2:00 p.m. with funeral at 2:00 p.m. Interment is to follow in Quiet Ridge Cemetery in Pickens, MS.
Memorial may be made to: Pickens Baptist Church, P.O. Box 399, Pickens, MS 39146 or Alzehimer's Association, 207 West Jackson Street, Suite #1; Ridgeland, MS 39157. 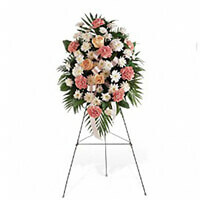 To send flowers in memory of George Day Wynne Jr., please visit our Heartfelt Sympathies Store. Mark A. Lehner and family sent flowers to the family of George Day Wynne Jr..
Prayers for all through this tough time. Mark A. Lehner and family purchased the Gentle Thoughts Spray for the family of George Wynne.